Today’s enterprise data centers are bloated, out of control, stuffed with extra servers, storage, and networking devices maintained at great expense to meet the requirements of maximum loads that only happen for a few days a month or one month out of the year. As a result, they use much more power, cooling, and space than IT can afford in this era of limited resources and soaring energy costs. The data center of tomorrow needs to be more flexible and efficient, use less space and power, and be easier to manage and scale. To get there, analysts predict enterprises will focus their infrastructure spend on virtualization, data center consolidation, and data center migration in 2011, while the leading organizations are already moving into private and hybrid public/private cloud architectures. Shifting costs from capex to opex by moving part of the data center to the public cloud, thus freeing scarce capital for more important investments. Optimizing human capital and IT resources by focusing internal resources on critical applications and data while moving more peripheral operations either to SaaS providers or public cloud infrastructure provided by companies like Amazon, Google, and Microsoft. Consolidating the data center by facilitating resource sharing through a private cloud infrastructure sized to support normal operations while drawing on public cloud infrastructure when needed to meet high demand. This will reduce operating costs such as power and cooling, maintenance, and administration as well as capex investments while increasing SLA compliance. Transferring risk particularly for maintaining high availability during high demand periods and mis-estimating work loads, from internal IT to the cloud service provider. Ensuring availability at lower cost by increasing flexibility with an architecture that automates shifting resources to meet increased demands both by reallocating internal compute, storage, and network resources and drawing on public cloud resources as required. Creating a successful hybrid cloud architecture, however, takes some thought. The basic question that must be answered is which applications and data should be retained in-house and which should be entrusted to the public cloud. Move active applications to a private cloud: According to Gartner, private cloud computing is gaining interest among large enterprises, with investments in private clouds increasing steadily through 2014. The biggest beneficiary will be the end-customer, as the growth of private cloud changes the relationship between the customer and the IT organization. Metrics will be based on service delivery. This will not necessarily be an easy change. It will require management support, process changes, funding changes, service standardization, and most important, changes in culture. But the advantages in increased resource utilization, savings in both capex and opex, and increased flexibility to meet demand changes, will more than pay for the investment. Move semi-active applications to public cloud: Applications/data that are less active and perhaps read-only, with lower SLAs that will not be impacted by access through the Web, and that have lower security needs, are candidates for public cloud platforms like Amazon EC3 and Microsoft Azure. 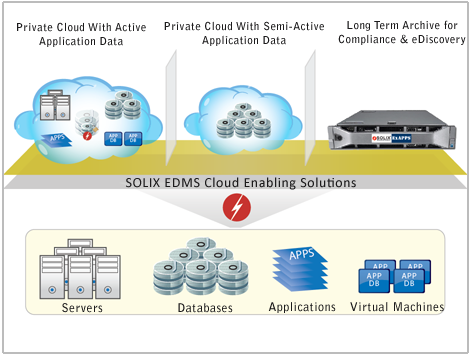 Move inactive data to Solix ExAPPS: Moving inactive, historic data to either the public or private cloud only increases your cost, since you are paying by GB/CPU, while providing little benefit, since this data is rarely if ever used. The better strategy is to retire this data using Solix ExAPPS, which automates the process based on customizable business rules while keeping the data available in a secure, read-only environment that meets compliance requirements for business data preservation.